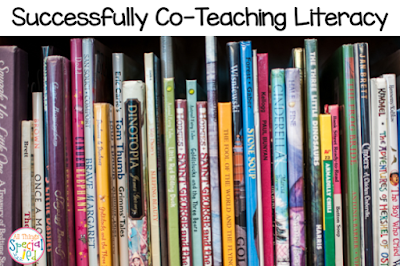 How to Successfully Co-Teach in Literacy - All Things Special Ed. I am finally TEACHING in the regular education classroom. I don't feel like a glorified para, I don't feel like I am sitting back wasting my skills by just supporting my students, I am finally teaching with my regular education co-teacher and teaching to ALL students, not just my special education students. My administrators have been trying to implement co-teaching but with the best of intentions as the year starts out, we can get pulled in many directions and students get added to our caseloads through out they year, a student is having emotional problems and all that can come to a halt. This year I was given the privilege and guarantee that I would be able to provide 90 minutes of my services in one classroom, uninterrupted. In order to do that, my special education team would help handle any situations that would need a special ed teacher and I would be providing services to our second graders (not all on my caseload but all in the same classroom as we had set it up). My co-teacher and I would also be given release four times a year (half-days) to plan and meet with our literacy coach. How is our literacy block set up? My co-teacher and I run guided reading groups for 60 minutes a day. That means we EACH get to 3 guided reading groups (20 minutes each) each day. She is on one side of the classroom with her reading gouger, I am on the other side of the classroom with my reading group and the other students are rotating through their daily 5 choice. At the beginning of the year we baseline any students who were not proficient at the end of the last school year and we divide the students up according to their reading level. We are flexible throughout the year and talk if we feel a student may need to move up or change reading groups. We also give formal running records 3 more times a year. Knowing that we have 4 special education students (ranging from autism, learning disablility, OHI and EBD) we could have smaller groups and one child is in a group by their self due to reading significantly below grade level. I can't tell you what a difference it has made for our students and our district test scores are showing great growth and progress with each student. The other 30 minutes of our reading block is dedicated to our universal reading program called, "Making Meaning". This program is set up to read a book (sometimes several times during the week) to the group and the students are partnered up to turn and talk. They get to work on reading strategies and answering comprehension questions with the purpose of them caring it through to their daily independent reading and guided reading time. This program also focuses on vocabulary so students are learning new vocabulary words and talking to their partners about these words. Instead of one teacher teaching this, we are parallel teaching. This means we are both teaching the same thing at the same time but I have half the class and she has half the class. We can provide more feedback to our students and the students are given more opportunities to share with the group. Being able to teach in the regular education classroom and being valued as an equal partner has put a spark back in my teaching. I feel like I have become a better teacher and our students are making tremendous growth. Have questions, feel free to leave a comment. 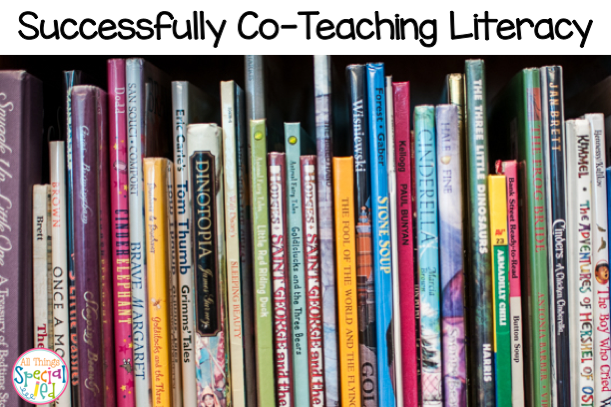 Do you co-teach? What have you found successful in your classroom? This is awesome! Isn't it great when it all comes together? I love when we can co-teach! This article has great reference value, thank you very much for sharing this educational information i was thinking to ask QandA for education, I would like to reproduced your article, so that more people would see it.